ITT Dublin proposes 35 associations, called societies and clubs, in a different area organized around the Student Union (ITT SU). There are also some societies like radio society or International Cultural Society which organized events and trips for mainly Erasmus students. 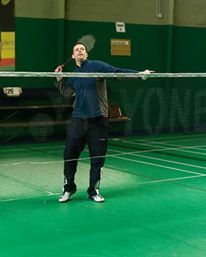 I decide to join the International cultural society and the badminton club. Trainings are on Tuesdays (2 to 4 pm) and on Fridays (6 to 8) near the college. It's only 3 euros a year for each club (so I pay €6). I like doing sport and I think I will meet other people. Here, this is our coach.